To Start take 1 of the leaves, and place the second leaf slightly lower to the left of the first leaf. Place one of the roses towards the first leaf centrally. (think how a coil of rope looks, and twist every stem in the same direction, that way you will have a very tight narrow stem at the end. Add the 2nd flower under the 1st flower slightly to the left. Now add the 4th leaf to the left , slightly below the 2nd flower. Using florist tape wrap the stem to hide the wires. using your glue gun attach the larger bow just under the last flower. 2. Trim 5mm from both sides to allow card to fit in box, made from 2 sheets of A4 card. 3. Trim Insert to fit. and stick inside the main card. 4. To make the top of your card. Cut 10 cm off an A4 Sheet of card. Giving you a 20 cm by 21cm piece of card. 5. Score both outer edges on the first line of the lid side of the box maker side of the crafters companion board. 6. Using the middle size of an Xcut oval cutter. Cut an oval from the middle of your sheet using the inside of the oval template. if you don't have the X -cutter templates, cut a rectangle shape from the centre with a craft knife and ruler. 7. Fold the creased lines and give each score line a nice tight crease, put double sided tape on the inside of the folded in lines. 8. Stick the piece of Wide lace to the back panel 14 ½ cm by 21cm, and secure at the back with double sided tape. 9. Stick the acetate to the inside of the aperture. and stick it to one side of the 14 ½ cm by 21cm Background card . 11. Add some detail to the outside edge of the aperture. 12. You now need to stick the raised aperture to the C5 card using double sided tape on all four sides. and extra in the middle. This card is made slightly smaller to fit in a box made from 2 sheets of A4 Card. 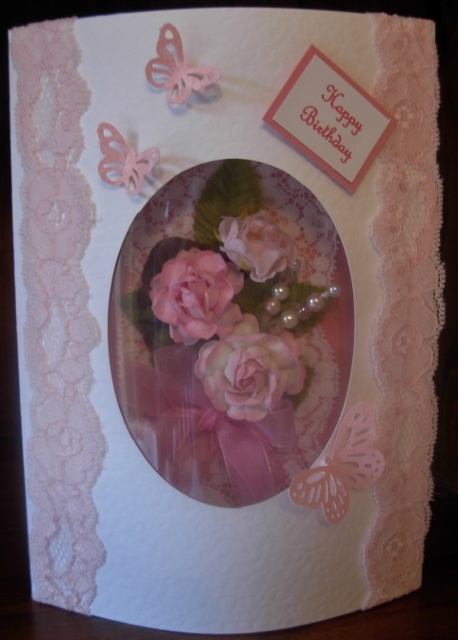 To make a box to fit this card using a Crafters Companion Board Score an A4 piece of card on the second line of the base side. And a second A4 card on the 2nd line for the lid side, cut a slit into each corner and stick with a glue gun. Or good quality book binding glue, lighter glue will not hold. And decorate with contrasting card ribbon and peel-offs.